Hi, lovely readers! I am so completely psyched to be here today and have this wonderful opportunity to show you the cover for Liz Czukas’ new novel! Without saying anymore, let me present to you the awesomeness that is Top Ten Clues You’re Clueless! Chloe would rather be anywhere than locked in work jail (aka the break room) with five of her coworkers… even if one of them is Tyson. But if they can band together to clear their names, what looks like a total disaster might just make Chloe’s list of Top Ten Best Moments. Don’t forget to add Top Ten Clues You’re Clueless to your goodreads shelves! Aren’t Liz’s covers just fabulous? Don’t you just love them? 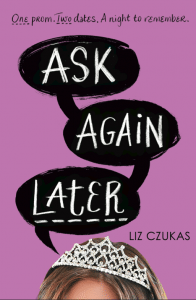 Check out my review for Ask Again Later and make sure to add the book to your goodreads shelves as well! 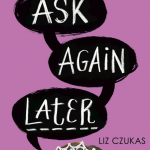 Want a chance to win a copy of Ask Again Later and some cool swag? 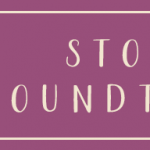 Giveaway is open internationally! Enter through the rafflecopter widget below! 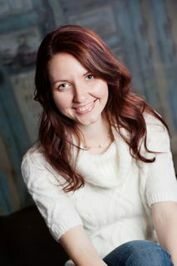 Liz Czukas is a freelance writer (on sometimes sad or boring topics), and also writes books for young adults (which are rarely sad and full of kissing). Before that, she was a nurse and she still kind of misses starting IVs. EEEEEEE! Hazel you did such a great job!! I love the way you put this together! Thank you! These covers are so adorable & perfect for the sort of light tone of the book(well, for Ask Again Later at least, and I assume similarly for Top Ten Clues). 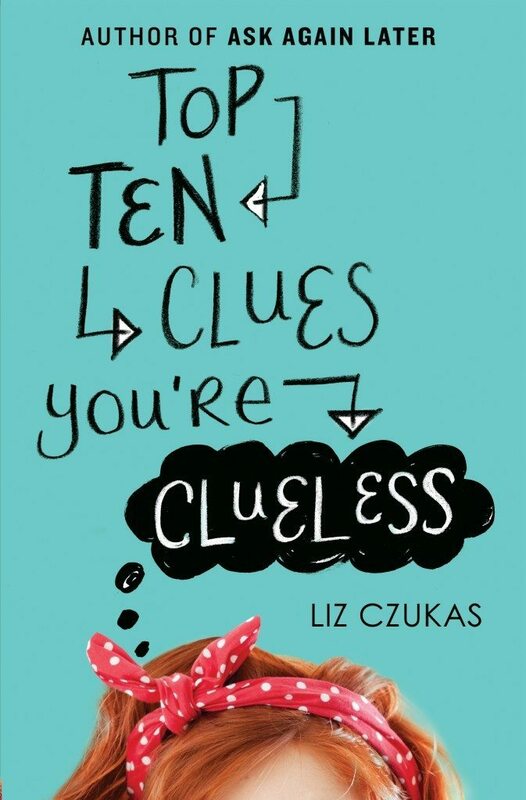 I really love the cover for Top Ten Clues You’re Clueless–blue background! great font for the title! Love it. I love the cover and it sounds like an amazing read!! That new cover is so adorable! I love the colors and the text. :) I love lists, so the book sounds pretty awesome to me. 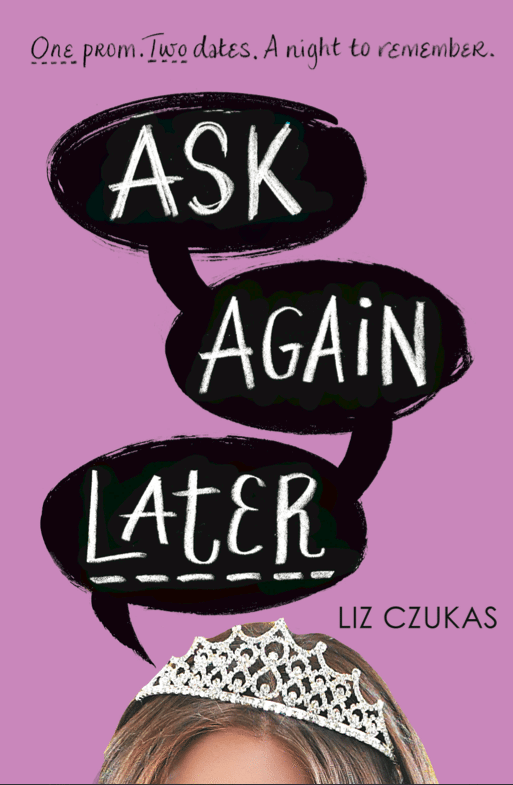 This cover reveal has made me more excited to read Ask Again Later, which I’ll be reading later this month. Thank you for sharing! I just love it when there are covers for authors all in the same design. It’s just so cute, and I think it’s great. It makes the books easy to pick out for fans. I also love the bold colors and the cute hand drawn elements on it. I actually see myself from Chloe! Here’s hoping I would win this giveaway cause I’m excited to read this! Amazing cover! I like this even more than the one from the first book! I love the font! I love the cover! It’s so cute and it’s in my fave color: Teal. I love it! The description sounds amazing, just like the Ask Again Later. And I love how both covers are similar, I’m kind of a freak when it comes to matching covers. Love Love Love the cover and preview and so want to read it even more now. I love these covers, so cute! The cover is so beautiful. I love the bow! Cute cover!!! Love the blue background! The synopsis, is clearly brilliant. I seriously think the cover is awesome & cute! I love that it’s kinda bluish, which is my fave.